By Bro. Charles Madden, O.F.M. Freemasonry Mankind's Hidden Enemy. New Expanded edition! A short; incisive examination of Freemasonry; giving a brief; clear overview of the subject. Written to convince today's Catholics that they must not join this cult. 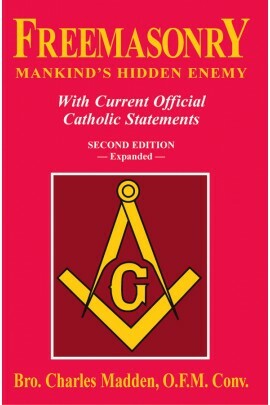 Quotes Leo XIII's famous encyclical On Freemasonry (1884); proves it is a secret society; a religion of naturalism and that it aims at subverting the influence of the Catholic Church. Gives current official Catholic statements; intended to end confusion about Catholics joining this cult. New material includes "Masons and Mafias;" discussing the partnership of these two groups in Europe; and Appendix F; "Kadosh--30th Degree;" which describes a Masonic ceremony which involves trampling on the papal tiara. "Before the war breaks out again, food will be scarce and expensive. There will be little work for the workers, and fathers will hear their children crying for food. There will be earthquakes and signs in the sun. Toward the end, darkness will cover the earth. When everyone believes that peace is assured, when everyone least expects it, the great happening will begin. Revolution will break out in Italy almost at the same time as in France. For some time the Church will be without a Pope." 2 Peter 3: 16. As also in all his epistles, speaking in them of these things; in which are certain things hard to be understood, which the unlearned and unstable wrest, as they do also the other scriptures, to their own destruction.